Slope Meters are typically mounted on the dash in the operator's view and will give fast, accurate readings for any slope. 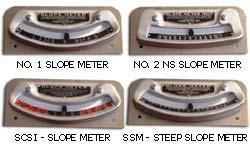 The Slope Meter enables the operator to construct true slopes without waves. They also make is possible to do night work just as accurately as in daylight. The hermetically sealed Slope Meter is not affected by rain, dust, snow, or sleet. When the Slope Meter is properly installed, it will accurately and continually indicate the slope of the ground being graded. This accurate indication of slopes between surveyor's stakes is very helpful, as it enables that operator to construct true slopes without waves.